Dickinson, Emily. The Complete Poems of Emily Dickinson. Boston: Little, Brown, 1924; Bartleby.com, 2000. www.bartleby.com/113/. [May 26, 2010]. …but I don’t regret capturing this view Lake County’s Ten Mile Range. I hopped out of my sunken Subaru and waded through the mashed-potato snow to stand at the edge of the reservoir, awed by the beauty of these snow-covered peaks. It only took a few minutes of shoveling to get out, but I’m still thinking of what it was like to stand there and bask for a few moments in the silent power of this place. 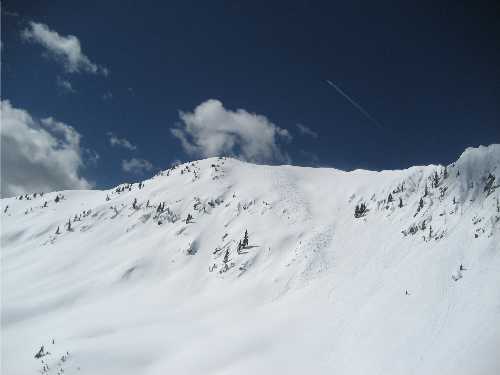 After two days of backcountry skiing with some super-strong guys, I headed out for a solo adventure on Friday in Colorado’s San Isabel National Forest. 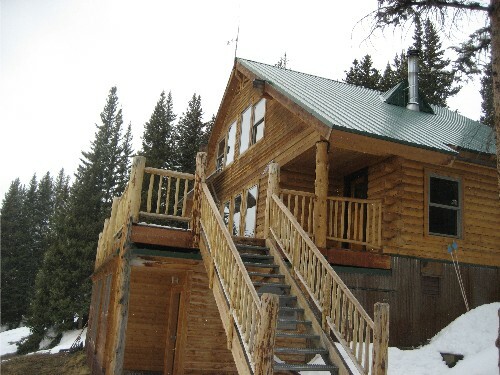 A friend of mine owns some private land in the area with a cabin on it, so I wanted to see if I could find it, and I also wanted to hike up to the Sangree Froelicher Hut, which is one of Colorado’s 10th Mountain Division huts. 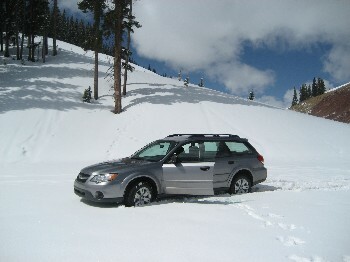 With all of the snow that’s continued to fall, of course, I also hoped I’d find some good powder turns on my way down. 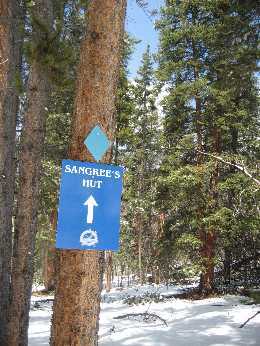 The trailhead to Sangree’s hut is the Buckeye Gulch Trailhead. 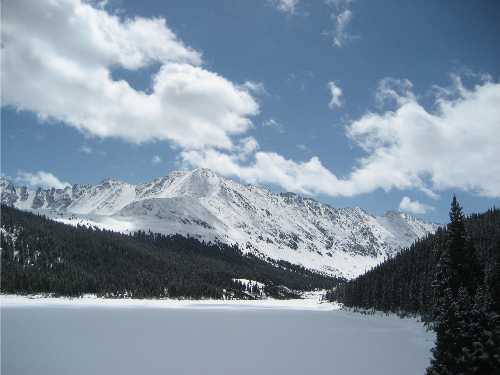 It’s just off of Highway 91, about 19 miles south of I-70 from the Copper Mountain turnoff. Beware: the parking area isn’t marked from the road, but once you’ve found it, the trailhead is marked with an obvious blue sign, and the route up to the hut is signposted extremely well with blue diamonds along the way. From the trailhead, the hike up to Sangree’s is about 3.25 miles, and (I’m approximating) it’s less than a 2,000-ft elevation gain. 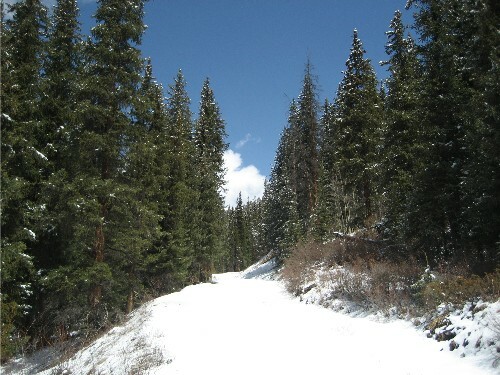 At the beginning, the trail is steep for just a bit, and then it widens out along a nice jeep road. At a fork in the trail, you’ll go west and enter back into a nice forest before the trail opens up again. The weather crapped out as I was skinning, and it was snowing sideways by the time I reached this area, but that fresh cover of snow made it nice for the descent! 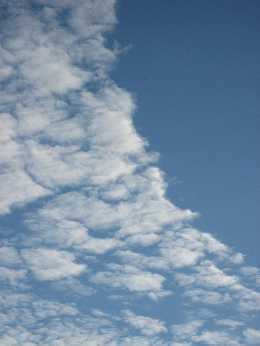 Such a shifty day…I was seeing blue skies again by the time I sighted timberline. …all of the doors were locked, so I couldn’t really snoop around like I wanted to on the inside. 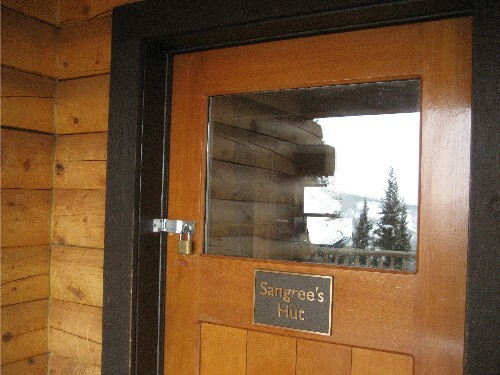 The hut is closed for the inter-season and will re-open in a few weeks for summer guests. 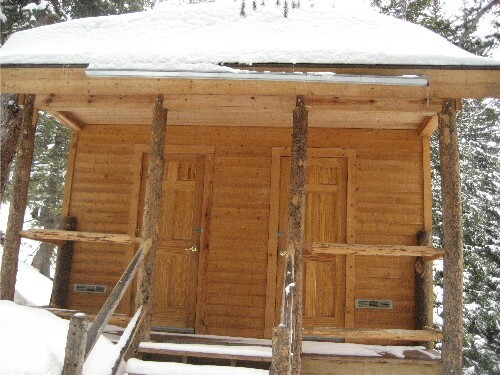 I wandered around back and found the luxury outhouse. Check it out! Not locked. So I tested the facilities. Very nice. 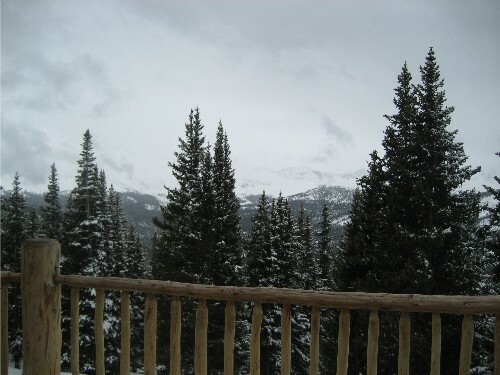 I hoped to take in some of Lake County’s big mountain views from Sangree’s deck, but gray clouds swirled around the peaks. Sometimes the reward for climbing up to a place like this is the view, and on others…it’s the descent. 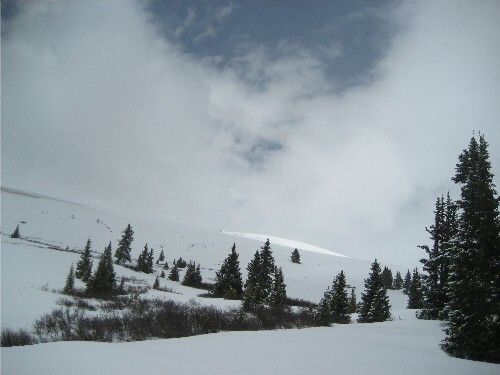 Definitely, this day’s reward was the ride down—a gentle ski through meadows and trees, and a short hike out to the car. Title: Broken: A Love Story // Author: Lisa Jones // Publisher: Scribner // Pub. 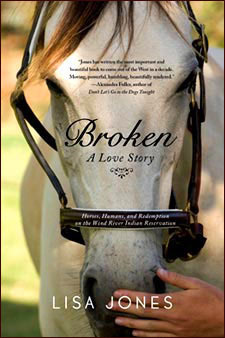 Date: May 12, 2010 // 288 p.
Published earlier this week, Broken: A Love Story is one of this month’s must-reads, especially for those who like: nonfiction, biography, Western literature, nature, horses, some good depth and reflection. In this book, author Lisa Jones writes about the life of Stanford Addison, a Northern Arapaho quadriplegic who has a special ability to break horses. From his wheelchair in a dusty corral on the Wind River Indian Reservation, Addison teaches others how to break horses, too, but it’s usually the people who walk away broken as much as the horses under the spell of this man’s spiritual gifts. Besides breaking horses, Addison also has a special way of helping people heal physically, emotionally, and spiritually. Lisa Jones first met Addison when she went to Wyoming for four days to write a magazine article about him. She was so moved by the experience that she returned repeatedly to Addison’s over the next several years, and in this book her story is intertwined with his. It’s a story of friendship, spiritual renewal, healing, and—above all—love. 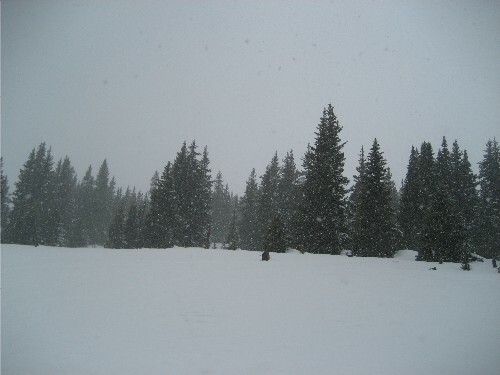 Tulips started blooming weeks ago in warmer climates, but it’s still snowing here in Vail, Colorado. And even though I like tulips, daffodils, chirping birds, and mountain bike rides, I’m not complaining about the continued snowfall. Last week, I was able to get out for three days on my randonée set-up, one day on Vail Mountain with a foot of powder and two fun friends who came over the pass from Copper. 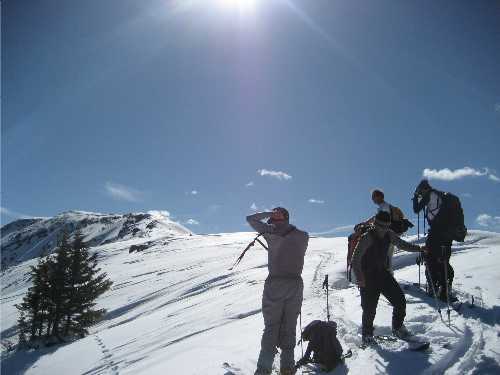 But one of the best spring mornings out skiing, however, was the morning I went out with a group of seven guys in my hometown’s big, big backyard. The objective? Fresh tracks. Found, and pictured above, at right. Billy M. was the fearless leader and lightning-fast climber. He jokingly told me not to tell anyone where we went, but I know he was probably serious, not wanting lots (more) locals flocking up this way and reducing the chances of fluffy, fresh tracks. So I’m not going to mention the name of the mountain we climbed. If you know the area, you probably already know. Lame? Whatever. I’m not going to lie. 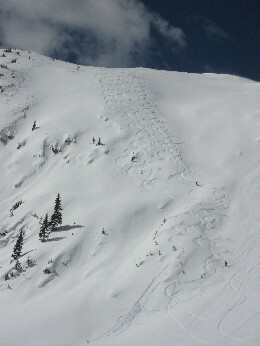 It hurt: skinning for three hours to the top of a mountain with seven guys who do this, like, every weekend. They were all in great shape, and I figured that they probably do some psycho stuff to train during the week, too. Being with this crew inspired me, made me want to be faster and stronger and more psycho in the mountains. One reward for getting punished up a mountain? The view at the top. 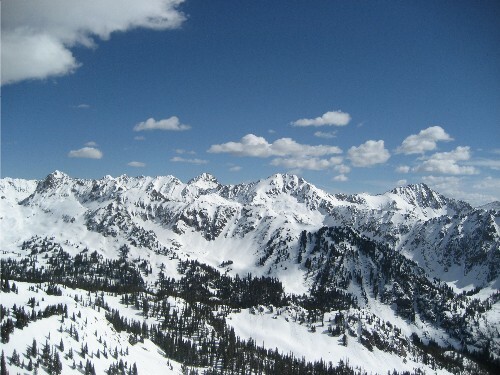 I gaze up at these peaks every day from the valley, but they look so much better from this altitude, don’t you think? 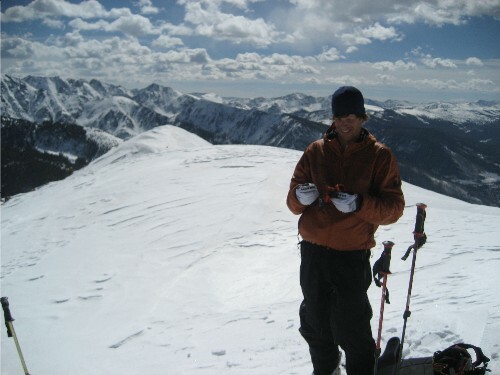 And then the ultimate reward for skinning to the top of a snow-covered peak? Skiing down. One by one, we took turns descending this nice north-facing slope and then adventure-skied our way through gullies, over streams along the trail home.